Retractable dog leashes are very convenient tools for letting your pooch explore its surroundings while still retaining some degree of control over its movements. 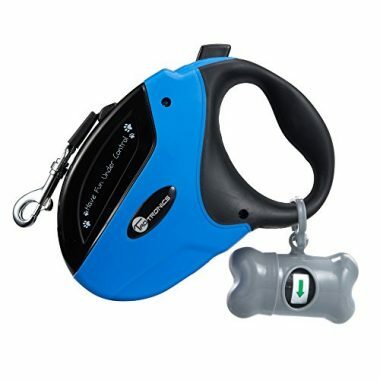 While there is a lot of controversy regarding its use because of the many potential dangers it poses not only to your pooch but also you, other people, and other pets, with the correct mindset and understanding of what needs to be done to make walking dogs with retractable leashes a lot safer for everyone, these contraptions can make for excellent tools for you to satisfy one of your pet’s innate needs. Also critical is your choice of the best extendable dog leash so you’ll be in a much better position to control your pet while addressing its need for freedom. These 10 best retractable dog leashes can help you identify the most appropriate one for your mutt. 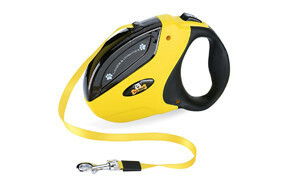 The TaoTronics pet leash is perhaps one of the best retractable dog lead products in the market today. It comes with a unique mechanism allowing you to let your mutt run wild and when it reaches a certain distance that you consider safe, simply apply the brakes and lock it into position. It also comes with a recoil feature that you cannot see in other products. Of particular importance is the strength and durability of its lead as it can easily handle mutts that weigh up to 110 pounds and for distances up to 16 feet. A bone-shaped waste bag dispenser is added to the ergonomic handle. Designed for one-handed operation at a price that’s a steal, considering the different features put into its design, it’s not surprising if the TaoTronics has the nod of many dog lovers out there. It’s easy to see why TaoTronics is the best in its field. It’s wallet-friendly, strong and durable, comfortable to hold, and comes with added features for a more meaningful walk. If you love taking a walk early in the morning or perhaps late in the evening, you’ll find the Neon to be especially useful. 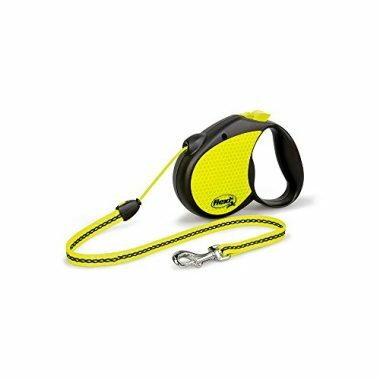 This Flexi leash comes with a reflective cord complete with neon-colored components and stickers on the casing to increase its visibility in the dark or in areas with poor visibility. The Neon comes with a 16-foot nylon cord allowing ample freedom of movement for your pooch. However, compared to the TaoTronics, the Neon can only handle pooches that weigh no heavier than 44 pounds. Nevertheless, with its German engineering, you can always rely on the Neon’s high quality construction. Its high visibility in the dark makes the Neon a great tool for nighttime walkers and joggers. At any rate, its sturdy craftsmanship justifies its heftier price. It doesn’t have reflective components like the Neon. 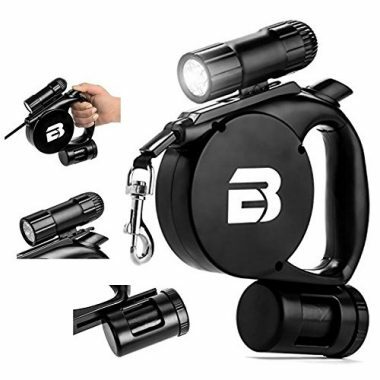 But the BC Retail retractable lead comes with a built-in LED light to help you illuminate your path in the dark. It also comes with a poop bag dispenser. Overall, you’d think the BC Retail is a new tactical weapon because of its uncanny design. 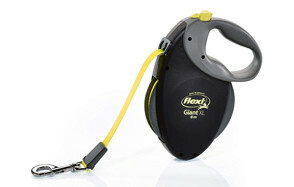 Regardless, its heavy duty casing and strong cord allows it to handle pooches weighing up to 50 pounds. Its length is a tad shorter than the Neon, though, at 15 feet. 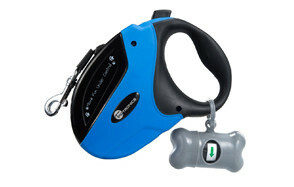 It also comes with a newly-improved locking mechanism to help prevent leash jamming. If you want something really inexpensive yet functional even in the dark, then the BC Retail is for you. 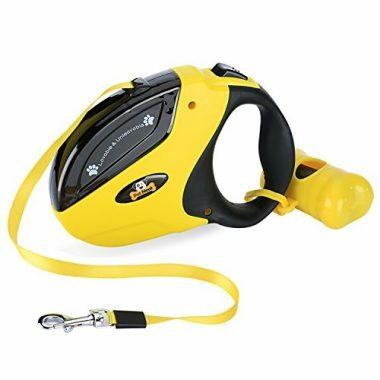 Another best retractable dog lead especially among sports fans and nighttime adventurers is the URPOWER retractable lead. With an unpretentious design, the URPOWER can easily come off as a newly designed steel tape measure. The only difference is that it comes with a belt leash that is embedded with a reflective material, giving it high visibility in low light conditions. The URPOWER also comes with a snap hook that is plated in chrome, giving it amazing corrosion resistance. Like the other products in this list, it is built for one-handed operation with exceptional brake and lock mechanism, keeping your 66-pound mutt safe up to 16.4 feet. It doesn’t include a poop bag dispenser though. With a price tag that’s friendlier than most, a durable cord and casing, and a fully functional brake and lock system, you can’t go wrong with URPOWER. Where others can only manage 16 feet of cordage for their long dog leads, this Flexi leash comes in at a whopping 26 feet and is available in 3 different widths of its tape. 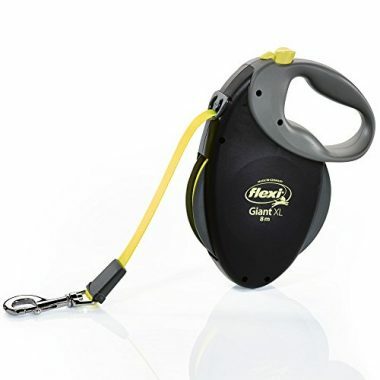 This gives the Flexi Giant exceptional usefulness if you want to give your mutt the kind of freedom that it needs but without you losing full control over its activities. Just like the Flexi Neon, the Giant also comes with a neon-colored, reflective belt which makes it a splendid gadget to use in nighttime walks or even jogging in low light conditions. Its German engineering allows it to retract and extend without hiccups, ensuring smoother and more efficient operation. Its one-handed construction allows you to brake and lock with just a single button. Too bad it doesn’t come with a poop bag dispenser. A bit pricey, too. If you’ve got the dough to spare and you have large dogs in your household, the Flexi Giant is a great choice. Its reflective, super-strong, and super-long lead is its biggest plus. 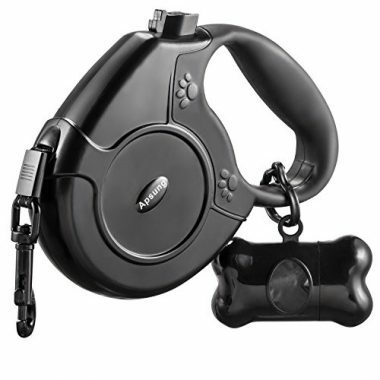 The Pet Neat retractable lead bears an uncanny resemblance to the TaoTronics product in that it also comes with a brake and lock mechanism, a 16-foot cord, and a 110-pound weight limit making it suitable even for large dogs. It even comes with its own canine waste bag dispenser in a color that matches the ABS plastic casing. The only difference between the Pet Neat and the TaoTronics is that it comes with 4 eBooks to help newbie dog owners in the proper care and maintenance of their pets. Whether this is coincidence or not, you might want to pick this one up especially if you’re new to dog ownership as the e-books can be of great help. The Pet Neat is reasonably priced, but you simply cannot shake the feeling that it’s made by the same manufacturer that makes those from TaoTronics. If any, the e-book should be a welcome addition to the package. 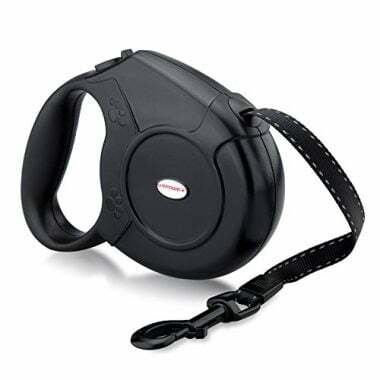 Another eerily similar to the TaoTronics extendable dog leash is this product from Apsung. It is designed especially for medium- to large- sized mutts that weigh up to a maximum of 110 pounds, clearly highlighting the durability and strength of its 16 foot nylon cord. The Apsung comes with a more conservative design, however, making it exceptionally appealing to more traditional pet owners who simply dislike very colorful devices that look more like toys than serious canine gadgets. As expected, the Apsung already includes a poop bag dispenser that’s shaped like a doggie bone. The ABS casing has paw prints embossed on its surface while its handle is ergonomically designed. If you’re more into conservative designs and at a price that won’t hurt your pocket, the Apsung promises to be a great choice. Featuring a belt feeder that operates smoothly, preventing tangling, the Hertzko is a heavy duty retractable pet leash that promises to give you optimum control over your pet’s activities even if your pooch is about 16 feet away. 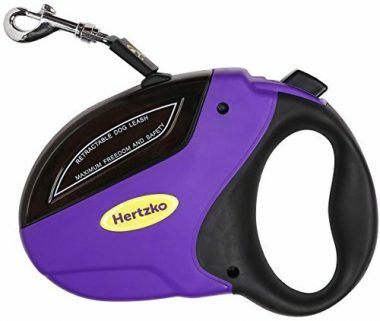 As you may already know, the Hertzko is pretty much the same as the TaoTronics except for one minor thing – the Hertzko is several dollars cheaper than similar designs. It has a weight limit of 110 pounds making it ideal even for large dogs. Holding the Hertzko is also comfortable, thanks to its superior anti-slip grip design. It also features the same brake and lock system found in other designs. If you want a TaoTronics for a significantly reduced price but without the e-book freebies of Pet Neat, then Hertzko is for you. This is especially useful if you have a large breed of mutt in your home. Don’t like colorful gadgets? Do you need a really conservative design that is pretty straightforward – no fuss, no frills? In that case, the WENFENG pet leash is for you. Just look at it this way. Try to combine the different features of a TaoTronics with the reflective band of a Flexi leash and you’ve got the WENFENG. It is actually this successful marriage between high visibility safety feature and superior cord strength and durability that make the WENFENG a great find. Now, throw in a lower than usual price tag and you have a product that appeals to a great majority of dog owners. Its unpretentious design at a price that’s friendlier than similar products make the WENFENG a good choice for those who own large breeds of pooches. Plus, its reflective band gives it a safety feature not found in other brands. Sleek and trendy, the GlowGeek is a favorite among the hipper crowd of mutt lovers. The orange on black motif gives it substantial visibility in dimly lit conditions, although the addition of a reflective 16 foot cord would have significantly improved its visibility. Nevertheless, the GlowGeek is durable and strong enough to hold even the toughest canines. 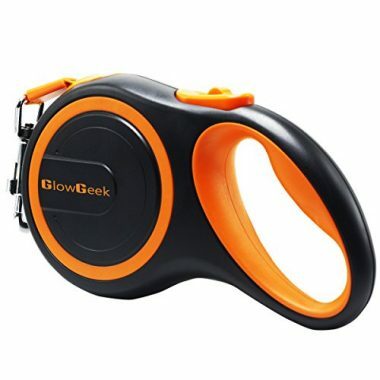 Do take note, if your pooch happens to be heavier than 110 pounds, the GlowGeek may not be able to handle it that well. It’s hip and comes with all the features of the TaoTronics but at a price that’s slightly higher. A leash is a great tool for training pooches especially in the earlier stages where they are still learning to listen and respond to your calls or commands. Typically there are two types of leashes, the conventional short leash and the longer extendable cord. Despite the fact that retractable dog leads have taken a lashing from animal experts especially veterinarians as well as animal rights groups, many still consider them to be exceptionally useful not only in training mutts but also in providing them the level of freedom that they deserve. One of the major issues that people have about the use of such leads is the lack or insufficient amount of control the owner has over the dog. If you lengthen the cord to its maximum, you are essentially extending the distance between you and your pooch. For your pet, this means freedom to do what it likes. Unfortunately, if it suddenly crosses a street or if a more vicious dog suddenly attacks it, the extra-long cord will make it quite difficult for you to control or even protect your pooch. Another issue is that with a sudden jerk on the cord, it is possible that it will snap. And because your mutt is more than 20 feet away from you, it would have already been in the next corner before you can even start running. The sudden jerk also places a risk on the integrity of your pet’s spine. There have been incidents of mutts getting spinal injuries because of the sudden jerking motion on the leash. Not only is there the risk of injury to your mutt, you also run the risk of injuring yourself. If your mutt happens to exert a more forceful pull on its lead, you might be drag to the ground leading to cuts, bruises, bumps, scrapes, and even fractures. You are also teaching your dog to pull on the leash, rather unwittingly. The point is that dogs learn that by pulling and tugging on the flexi cord, they are able to increase their space and hence, freedom. These are all valid concerns. The great news is that there are things you can do to help you dispel any safety concerns other people may have about these flexible leashes. 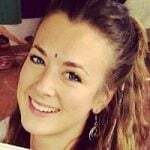 It is thus, critical to choose and purchase only those that have certain features which can help allay these fears or concerns. Any product can have its own set of pros and cons. While we have already shared with you some of the reasons why experts are saying retractable leashes should never be used on dogs, you would definitely be relieved to learn that there are benefits of using a retractable leash, too. We’ve listed some of the more common below. Allows dogs to be dogs. Dogs in the wild are not limited in their exploration. There are no leashes to tie them down. While one can always argue that the pooches we have in our homes are definitely not the wild ones, they will still need some degree of freedom to be themselves, to be the ‘dog’ that they ought to be. 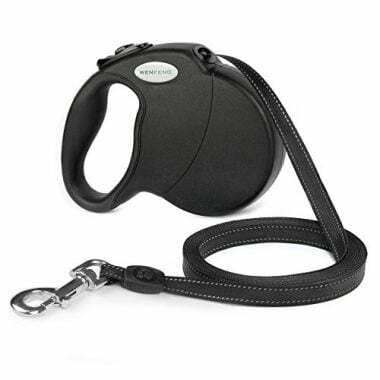 Getting a retractable lead can help provide them with a certain sense of freedom to wander and explore. This is especially true if you have mutts that are mostly happy if they get to go on a sniffing adventure without you having to nudge or pull them every now and then. The considerable distance between you and your pet can somehow be interpreted by your mutt as a sign of letting its true canine nature to run free. And you know how this can help in the development of a healthier dog psychology. Part and parcel of an extensible lead is that you can easily vary its length. If you are in an area where there are simply too many obstacles or perhaps a lot of people or pets, then shortening the cord to the length of a standard leash is easy. If you want your mutt to stay by your side in these circumstances, then you can shorten the length of the cord and lock it in place. But once you are already in an open field where there are no obstacles or risks to you and your pet, then you can lengthen the cord again. Technically, the responsibility for adjusting the length of the lead falls squarely on your shoulders. This way you can ensure the safety and need for exploration of your pet. Can be used for recall training. Teaching your pooch to come to you when you call its name is an important task for any serious pet owner. This increases the safety of pooches whenever they are outdoors. A well-trained mutt will immediately run to its owner when it is called. Like any other canine training, recall training can take a while to master. The trick is to allow your pooch to move or wander progressively farther away from you. This is where a retractable leash can truly help because it eliminates the need for multiple leads. For example, on the first stage of recall training you will let your dog to wander within 10 feet of your location. Once it learns to come to you the moment you call its name or let out a sound, then you can increase the distance to 15 feet, then 20 feet, and so on. If you don’t use an extendable lead, then you will have to purchase 3 to 4 leashes of varying lengths. A retractable pet leash, especially one that has unusually long cord, will be very instrumental in your canine recall training. May be more useful for persons with disabilities. Individuals who have physical limitations can benefit a lot when they have assistance dogs that are put on a retractable leash. While well-trained assistance dogs don’t necessarily need a leash for the simple fact that they are trained to obey their masters, there are still those that may require some form of control. For instance, if the person cannot stand up and would like to perform a task, he can actually command his pet to perform the task from a distance. Moreover, because of the longer cord of these types of leashes, the risk of the cord getting caught in the wheels of the wheelchair is technically lower than standard leads. May aid in canine elimination. Can you easily pass your poop if someone is standing right beside you? We can only guess that your answer is ‘no’. While you may think they don’t need privacy when they need to potty, some dogs simply cannot pass efficiently with their masters standing beside them. Some pooches would want some degree of privacy when they have to go. Having an extendable lead should help them go somewhere hidden, more private to do their business. It may seem so absurd, but it really helps. What Length of Leash Do I Need for My Dog? Given that the main difference between a standard and a retractable dog leash is in the maximum length of the cord, it is thus, important to identify the best possible length of leash that is best suited for your dog. Standard dog leashes typically range in length from 4 to 8 feet, although 6 feet is a very popular option. You should choose this length if you require absolute control over your dog such as during obedience training and behavior modification training. If you run or jog on a daily basis, it is also a good idea to have a leash that is shorter in length so you can control your mutt to run alongside you. More importantly, choose the shorter length of leash if you are in high traffic areas, locations with substantial hazards and obstacles, and relatively tight spaces. If you require versatility in the amount of control you exert over your pet, then a retractable leash is perfect. These can be as short as 4 feet and fully extended up to 30 feet. It also comes with a locking mechanism that helps ensure the length of the cord stays at the level you want it to stay. So, if you require absolute control such as when using a standard dog lead, then you can simple adjust the nylon cord length to the shortest possible setting. If you want your dog to enjoy its freedom, allowing it to explore its surroundings, then you can adjust the cord to its full length. Retractable or not, a leash is a great tool if you’re going to take your pooch for a walk or even exercise. However, because there are issues about the risk of the cord getting entangled or even the risk of strangulation on your pet, it is important to learn how to properly use a retractable leash. 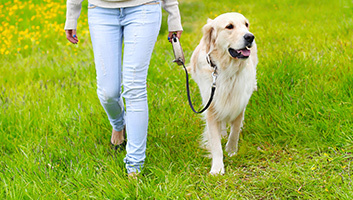 Here are some tips when walking your mutt using a retractable leash. Plan your walks – We have already mentioned that extendable leashes should never be used on areas with high traffic or where the leash can get entangled on obstacles. That is why it is imperative to plan your walk. Make a mental image of the location of hazards or obstacles so you can steer clear of these when you’re already in the area. Inspect your surroundings – Think of yourself as the pivot or the center of a large wheel. On the periphery of this wheel is your pooch. You will need to inspect and assess what is inside this ‘wheel’ as well as its immediate vicinity. This way you can make adjustments in the length of the cord. Pick a leash that’s highly visible – Because your pet will be farther away from you, other people in the area might see your pooch but not you. They might mistake it for a loose dog and report it to animal control. Having a leash that comes with a reflective material or is highly visible even from afar should help prevent this incident. Use only a length that you can really handle – The shorter the length of the lead the more control you have over your pooch. Try to determine the length of cord that you are most comfortable with. If you’re confident that you can still control your pooch at maximum distance, then by all means, do it. Don’t use a retractable leash on strong and large dogs – Large and powerful dogs should always be put on a standard leash. One mighty jerk from them and they’re off if you will use a retractable version. These 10 best retractable dog leashes are excellent tools for walking and even training your pooch. However, it is important that you know how to use these to help prevent the issues associated with faulty usage. Knowing how to use also optimizes the many benefits that it can give you and your pet. It is also important that you learn how to walk your pooch on a retractable leash. Only by using these types of leads in the correct manner can you realize the usefulness of such devices.